If you built your own PC and bought speedy RAM, there’s a good chance that RAM isn’t actually running at its advertised timings. RAM will always run at slower speeds unless you manually tune its timings–or enable Intel’s XMP. This option isn’t available on every motherboard’s BIOS, and not every stick of RAM has an XMP profile–some RAM is just designed to run at standard speeds. But, if you built your own gaming computer and bought RAM advertised with fast speeds, you should definitely have XMP as an option. RAM must adhere to standard speeds set by JEDEC, the Joint Electron Device Engineering Council. Even if you buy RAM advertised with specific timings that make it faster than the standard and insert it into an motherboard designed for gamers and other enthusiasts, it won’t immediately run at those advertised speeds. It will instead run at the standard speeds. However, you no longer have to go into your BIOS and manually set the RAM timings value by value. Instead, the RAM you buy has a small amount of storage on it that provides one or two Intel “Extreme Memory Profiles.” Your BIOS can read these profiles and automatically configure the optimal timings chosen by your RAM’s manufacturer. These will be the RAM’s advertised timings. If you have an AMD CPU instead, you may be able to enable “AMP”–AMD Memory Profiles. This is AMD’s version of Intel’s XMP. You can check your RAM timings from within Windows. Download CPU-Z, click over to the Memory tab, and you’ll see what timings your RAM is configured to run at. Compare the timings you see here to the timings your RAM is advertised to run at. If you built your own PC and never enabled XMP, there’s a good chance your RAM timings are slower than you expect them to be. To enable XMP, you’ll need to head into your computer’s BIOS. Restart your computer and press the appropriate key at the start of the boot process–often “Esc”, “Delete”, “F2”, or “F10”. The key may be displayed on your computer’s screen during the boot-up process. If you’re not sure what the appropriate key is for your computer, check your computer’s–or your motherboard’s–documentation. Poke around in the BIOS and look for an option named “XMP”. This option may be right on the main settings screen, or it may be buried in an advanced screen about your RAM. It may be in “overclocking” options section, although it isn’t technically overclocking. If there are two profiles to choose from, they’ll often be extremely similar, with one just having slightly tighter memory timings. You should just be able to choose “Profile 1” and be done with this. However, you could try enabling each profile in turn and choosing the profile that provides you with faster memory speeds, if you like. 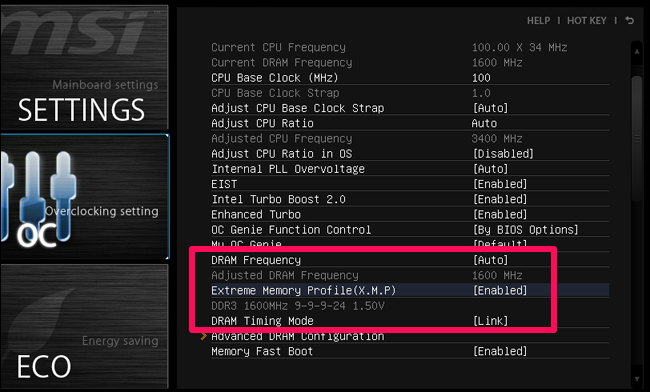 To do this, enable an XMP profile and look around your BIOS for the RAM timings to see how they changed. You can also just boot back into Windows and open CPU-Z again. 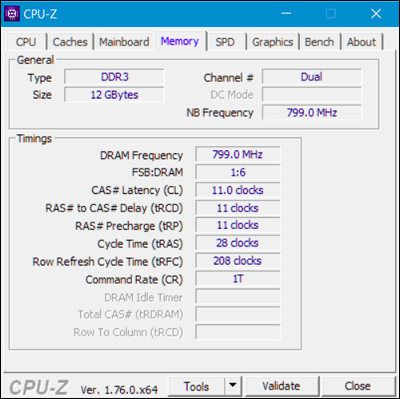 Whenever you insert RAM that’s advertised with faster-than-standard speeds, just head to the BIOS and enable XMP to ensure that RAM is actually running at those speeds. While it’s simple, it’s easy to miss–especially if you’ve never heard of XMP and don’t know you need to perform this extra step.